The Salvation Army’s signature Red Kettle Campaign set a new record this past holiday season, raising nearly $150 million, up 3.4 percent compared to the previous year. Online donations were up 7.5 percent compared to 2014. The 2015 campaign, the army’s 125th, collected $149.6 million in all compared with $144.7 million the previous year. It’s the largest total raised since $148.7 million was reported in the 2012 campaign, according to the organization. About 700 Big Lots locations raised $1.2 million. For the 19th year in a row, the the Red Kettle Campaign kicked off on national television during the halftime performance of the Dallas Cowboys football game on Thanksgiving Day. 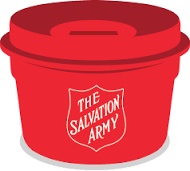 The Alexandria, Va.-headquartered Christian church continued its #RedKettleReason initiative, giving supporters a platform to share their personal connection to the kettles and donate online. Celebrities, corporate partners and donors shared their reasons by tagging social posts with #RedKettleReason.